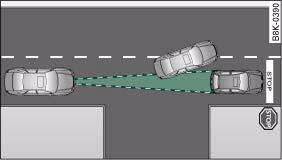 The following situations could impair the function of the radar sensor. • When driving through bends. • When vehicles in front are not in line with your vehicle. • When other vehicles change lanes. • When vehicles are stationary. 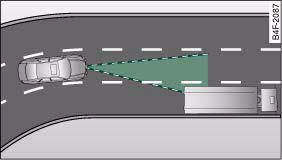 The radar sensor's "field of vision" can be impaired by rain, snow or a lot of water on the road. 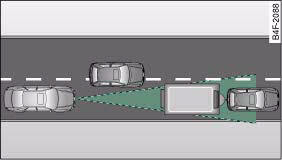 This results in vehicles in front not being properly recognised or, in some circumstances, not being detected at all. If necessary, take action yourself! 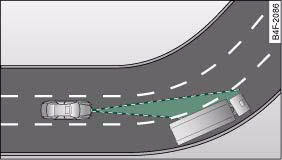 When you are driving into a bend, the ACC system may react to a vehicle travelling in the other lane and therefore brake the vehicle, fig. 149. You can override the braking effect by pressing the accelerator. When you are driving out of a long bend, the ACC system may - in the course of its calculation of the lane ahead - react to a vehicle travelling in the other lane and therefore brake the vehicle, fig. 150. You can override the braking effect by pressing the accelerator. 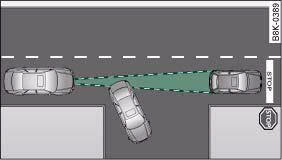 Vehicles in front which are not in line with your vehicle cannot be detected by the ACC system until they are within the range of the sensor. Vehicles which are very close to you when they move onto your lane cannot be detected by the radar sensor until they move into its range. Vehicles that are not clearly discernible, e.g. a motorcycle travelling in front of you and vehicles with a large amount of ground clearance or protruding freight, are often identified late or may not be detected at all. 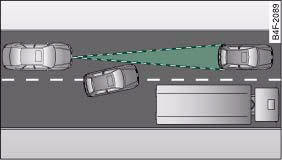 If a vehicle detected by the ACC system turns off or changes lane and another stationary vehicle is located in front of that vehicle, the ACC system will not react to the stationary vehicle ⇒ fig. 154 and ⇒ fig. 155.